I was thrilled when I discovered, a few months ago, that Hotel Chocolat had finally opened a branch in Cardiff. I felt it was long overdue in the city – although it had been possible to buy a few Hotel Chocolat lines in John Lewis, it certainly wasn’t the same as being able to wander into a shop and lose yourself amongst the chocolatey delights! So, I was even more thrilled when I was asked if I would like to review one of Hotel Chocolat’s Easter eggs. I’ve always loved their rich, high quality chocolate, and the unusual tasting bars they offer, but had never tried one of their Easter products, having always felt that the occasionally gimmicky concept of Easter goodies was a bit at odds with the altogether more classy brand of Hotel Chocolat. I don’t know whether the egg I received had been chosen specifically for me, but it certainly could have been! Those who know me will know that I have a penchant for all things animal print, so when I received a ‘Zebra Beastie’ egg, I was delighted: a beautiful, shiny, chocolate egg with zebra stripes – and Hotel Chocolat branding on the chocolate itself (apparently the pattern is achieved by an all-natural cocoa butter transfer)! Also in the range is one with cow print. I’m hoping that next year they might do a leopard or giraffe version too – those two being my favourite prints! But I digress. The egg was packaged in cellophane, perched on a zebra-striped base and tied with a ribbon. Accompanying the large egg were six smaller, filled eggs: three filled with a gorgeous, rich, smooth praline with just enough nut flavour to contrast with the rich chocolate shell, an three filled with salted caramel, the caramel so thick that there was no chance of it running down your chin if you bit into the egg(!) and with just a hint of salt to counteract its sweetness. The small eggs each had a coloured embellishment on the top. The milk chocolate of the egg itself was not as thick as I thought it might be, but still took some cracking, and to my delight was a whole egg, rather than two halves held together by the packaging. The chocolate was rich and delicious as I would expect from Hotel Chocolat – there’s certainly no compromise on quality just because it’s more of a novelty product. On Hotel Chocolat’s website, the egg is described as a children’s Easter egg, but I think its subtlety and richness might actually be lost on all but the most discerning of chocolate loving children. 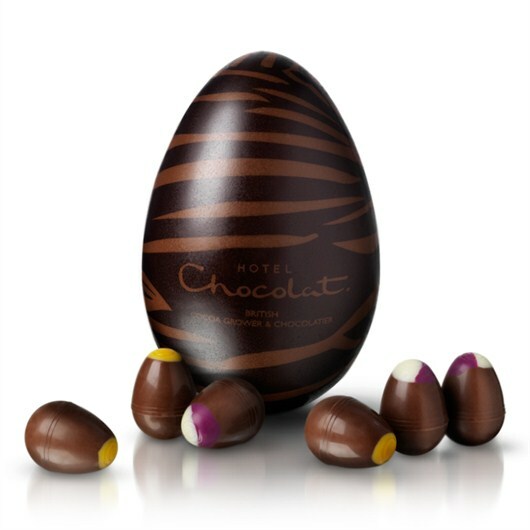 The Zebra Beastie egg is £15 and manages to perfectly combine the luxury brand of Hotel Chocolat with a bit of light-hearted Easter fun. I loved my egg, and it’s not too late to treat your loved one to something similar, from the new(ish) Hotel Chocolat in Cardiff. I’d definitely be very happy if someone bought me one of these for Easter. Hint, hint! Thank you to Hotel Chocolat for supplying me with a complementary egg to try.